This week and the week after we are hosting two GitLab employees to discuss different aspects of using GitLab effectively. All webinars are free of charge. 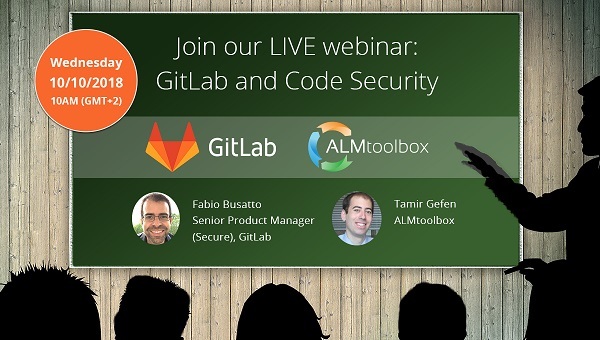 We are hosting Fabio Bussato, Senior Product Manager of Security in GitLab Company, to discuss new code security capabilities included in Gitlab. We plan to record this! You should register even if you can’t attend at the given time – we’ll send the recording to all registered users. We are hosting Xiaogang Wen, Solution Architect at GitLab Company, to learn how to work with GitLab CI. GitLab provides a single application for the entire DevOps lifecycle, including version control that’s tightly integrated with strong CI/CD . GitLab CI/CD is an award winning CI tool (see the Forrester report below) and is also the leading CI/CD system today, if you need excellent support of containers and Kubernetes. We plan to record this webinar! You should register even if you can’t attend at the given time – we’ll send the recording to all registered users. ALMtoolbox company is a GitLab Premier Reseller.